Investigating the sleeping habits of snakes is a challenging proposition: Unlike most other animals, closing their eyes to sleep, snakes lack movable eyelids. 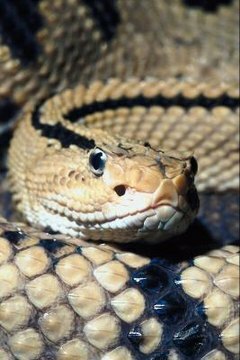 Scientists have discovered some patterns of sleep in strongly diurnal snake species, rattlesnakes change their activity patterns throughout the year. Most of the 38 living rattlesnake species are ambush predators who spend long periods of time in one place and probably sleep intermittently throughout the day and night. The scaly covering of snakes does not stop at their eyes. Instead of a movable eyelid, snakes have a clear scale called the spectacle, covering each eye. At times -- presumably while the animals are sleeping -- snakes constrict their pupils, which allows less light to penetrate their eyes. According to herpetologist Laurence M. Klauber, in his book “Rattlesnakes: Their Habits, Life Histories and Influence on Mankind,” he was able to rouse sleeping rattlesnakes by shining a penlight into their pupil. He notes that captive snakes readily go back to sleep after being disturbed. Most rattlesnakes are sedentary snakes that spend long periods of time waiting for prey to walk by. Timber rattlesnakes (Crotalus horridus ssp.) often sleep with their heads resting against logs or trees. In such positions, a number of stimuli -- including infrared, olfactory, vomeronasal, tactile and visual clues -- may serve to alert sleeping snakes that prey is available. Additionally, reptiles are thought to engage in unihemispheric sleep, meaning that one side of their brain sleeps at a time. If this is the case, rattlesnakes may be able to gain the benefit of sleep on one side of the brain while remaining aware of their surroundings with the other. At least some snakes use different sleeping sites as they grow. In 2011, Chad E. Montgomery of Truman State University and colleagues Karen R. Lips from the University of Maryland and Julie M. Ray from the La MICA biological station in El Cope, Panama, studied the sleeping habits of vine snakes (Oxybelis brevirostris). Publishing their results in an issue of “The Southwestern Naturalist,” the team found that the larger the snakes were, the higher they slept off the ground. As many rattlesnakes exhibit different prey and habitat choices as they age, it is likely they frequent different sleeping locations as well. While no studies have focused on sleeping behavior in rattlesnakes, James W. Hicks and Marvin L. Riedesel investigated the sleeping physiology of garter snakes (Thamnophis elegans). Publishing their results in a 1983 issue of the “Journal of Comparative Physiology,” the team found that garter snakes slow their respiratory rates significantly for the duration of the night. In contrast to rattlesnakes, who exhibit a wide variety of diel or 24-hour activity patterns, garter snakes are almost exclusively diurnal, so it is unclear whether rattlesnakes would exhibit such a strong dichotomy. Sleep Medicine; Teofilo L. Lee-Chiong, et al.